Manager Stuart McCall reckons Rangers may have been fortunate to beat Hibs 2-0 at Ibrox but was proud of his players' play-off semi-final efforts. 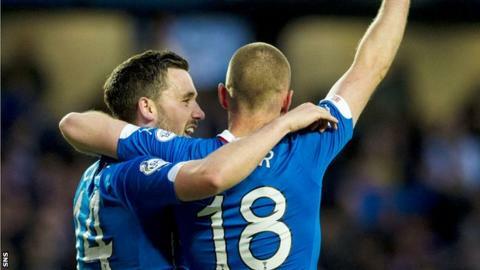 Nicky Clark and Kenny Miller scored the first leg goals for the hosts, who withstood periods of pressure. "I think the scoreline flattered us," McCall told BBC Scotland. I thought Hibs showed what a good side they are. "It was a tough slog but we got two real quality goals and there was a steely determination about us." Rangers had to defeat Queen of the South over two legs to set up the tie, while Hibernian were able to visit a training camp in Spain during their 18-day wait. The sides meet again on Saturday at Easter Road, with the winner facing Motherwell in the final. "You could certainly tell in the last 25 minutes who had been resting, our energy levels dropped a lot, but they put so much into it," added a delighted McCall. "Full credit to my team there because we've had to defend some great set plays from Scott Allan." McCall believes the win demonstrates his side have the desire which some fans felt was lacking earlier in the season. He said: "When questions have been asked about us since me and Kenny [Black] have been here, them lads in the dressing room have performed and stood up, and nobody can point a finger at them. "Give them credit where it's due. That's two clean sheets we've had against Hibs back-to-back and we know we'll need to defend really well on Saturday. "We certainly won't be going there to sit in because I don't think we can sit in for 90 minutes, but we'll have to defend as well as we did tonight. "We've just got to give everything we've got for the jersey. Hopefully when the referee blows his whistle we're through to the final."